Situated within this reserve is an Adventure Playground, which has been well awarded and well used now. With a tunnel and a bridge over it, it lends itself to lots in a child's imagination; there are swings, of course; a climby, spider web thingy, and these little tulip cups/rides (and I use the word ride loosely), because my child had the bejeezus scared out of her, when she sat in one and the stupid thing wouldn't stop spinning round, with the momentum, and suction (apparently), so parents, do not find these things hilarious (I do now), and do not let your kids be launched off, but do stand by. Anyway, there's enough to let your children run rampant and let off a bit of steam here. 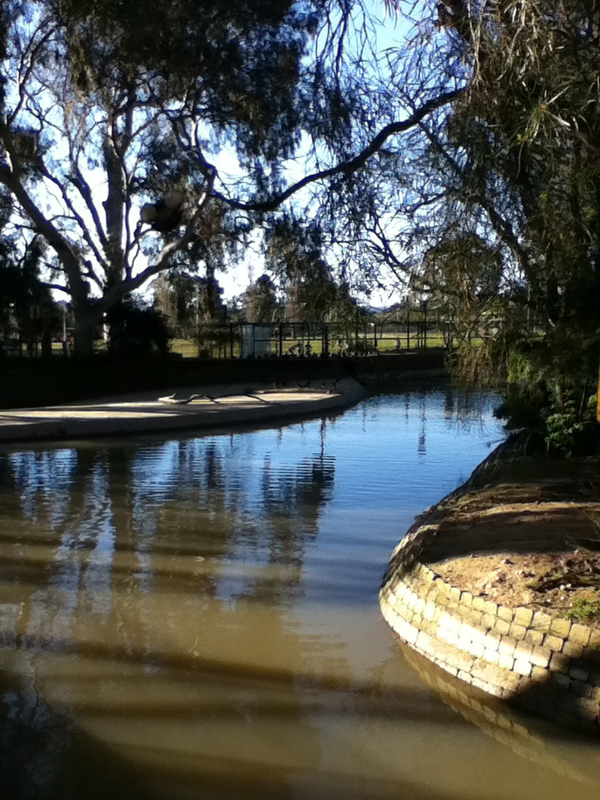 A bit further up, past the footy club on the middle oval (there are three ovals here folks), are some cricket practice cages, yet another smaller playground and this amazing duck pond, with an island in the middle of it. It has a walkway round most of it, which is fenced off. 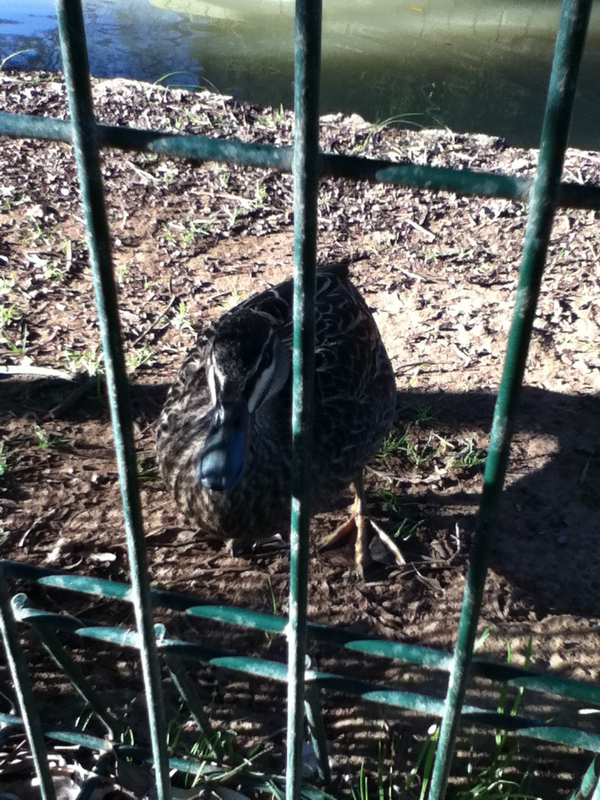 The great thing is you can view the ducks in their natural environment, from this quite well. We've witnessed a whole duck cycle at this pond, by visiting it regularly; from one visit to the next, you can see either: Mum, Mum & Dad, & then, miraculously sometimes, Mum & Dad out walking the kids. Ducklings? Well, you can't get much cuter than this. pigeons like to join in! Just the greatest 'unwinder', with or without the kids, is to spend some time watching the ducks. Kids small and large will love this activity, as I do. 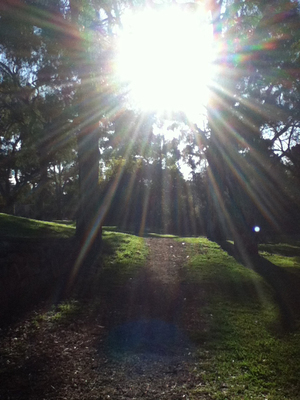 Sit on a nearby bench and you can meditate on the week that was, the week to come or just ruminate on being. 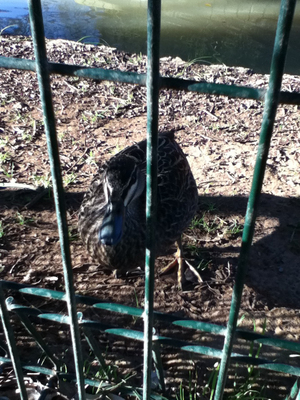 The ducks will even come up close, either inside the fence or walking outside and around, as they often do. They'll come up. Pigeons do too. Seriously, with two playgrounds , three ovals, maybe six tennis courts and a tennis club/rugby club, the Kensington Pk Kindergarten and plenty of room to move, this park may have it all. There are a number of barbecues here, across the reserve, on either side. And if you want to' walk happy', but don't really like walking on public roads, well , you can walk your half an hour round one of the ovals here. 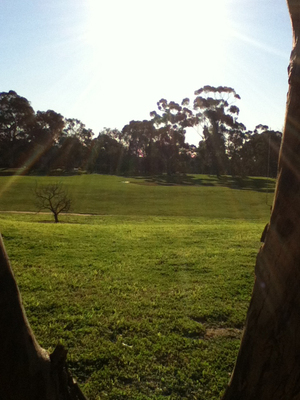 The sunset view through the trees from the top oval near the duck pond or looking down The Parade, from this park, is just superb too. The top oval, has a slight embankment close to the duck pond, from where if you sit, you can get such a great view back through the trees, to the city, of the sunset. Back down on The Parade, you also look down at the skyline of the city, which, at sunset, literally takes your breath away. Soft pinks, orange, burnished gold and a faded yellow finally, go to makeup the end of another day there. Now, think about it and sometime just stop and park the car here, or walk even, at a time close to dusk, with or without a partner, and sit on the grassy embankment or just the grass, and take it all in. Let things go and see what nature at times, gives us. It's such a lovely occupation, watching the ducks and pigeons with your children or alone, even. After you've played with the kids at either of the playgrounds, do make sure you take that extra time to go and spend time with the birds too. You'll love it. There's something kind of raw and rustic here. Just watch out you don't have to take up Irish river dancing, to avoid the dog droppings, variously left by the dog owners at times.